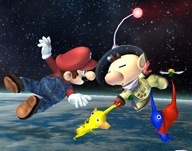 Guy and leaf friends confirmed for Brawl - GameSpotting! Posted on January 9, 2008 by MASA. Otherwise known as Captain Olimar and Pikmin. He was a smash trophy in Melee, and now both characters are confirmed as a playable character. Neato! Though I don’t see him as a potentially strong character. In order to attack he has to get Pikmin from the level to do smash attacks and various stuff like that. Yeah, that could be a really big problem in big brawls where time is short and you need to act quick to survive. Either way, it seems kind of cute for the new addition. Though I doubt I will see anyone playing as him. Also, there is some evidence on a Pikmin map appearing in the game. We’ll probably hear about it soon.